It’s one thing to teach the Word effectively. It’s another to teach others to study the Word for themselves. 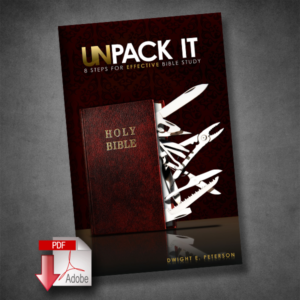 UnPack It provides a quick and accessible method for integrating Bible study skill development into your ministry mix. Rather have a digital copy? Get that here. Volume discounts added in your cart! UnPack It outlines the framework for strategically equipping your ministry or family for effective Bible study. Each section includes key questions that connect their content to your specific ministry environment. Walk through the content on your own or with your ministry team. UnPack It ends with four curriculum exercises to help you transition from strategy to action in a practical and accessible way.